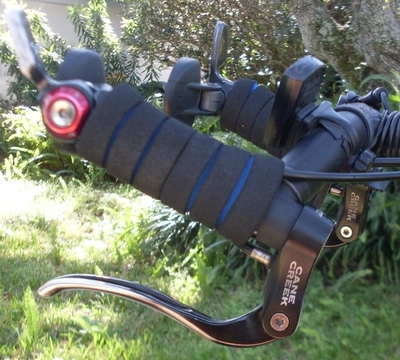 RailGun Barends are custom gunner-style barends designed to allow expansion-plug aero shifters to be mounted in the top of the bar and expansion plug aero brake levers to be mounted in the bottom. 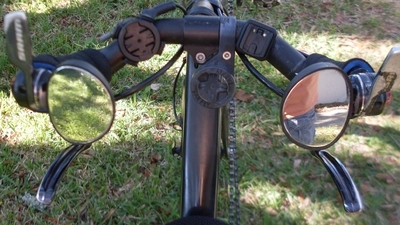 These barends are intended to be implemented as gunner bars but allow shifters and brakes to be mounted inline with each other so they can be used at the same time by palming the brake levers while shifting with the thumb and/or fingers. This means that you should be able to shift and brake at the same time without moving your hand! This bar arrangement also allows a completely relaxed hand position and forearm orientation, causing far less stress and steering input than any other recumbent bar arrangement I have ever tried since your forearm isn't twisted as with most other tiller arrangements. You can simply lightly hang from the bars with your fingers completely relaxed. 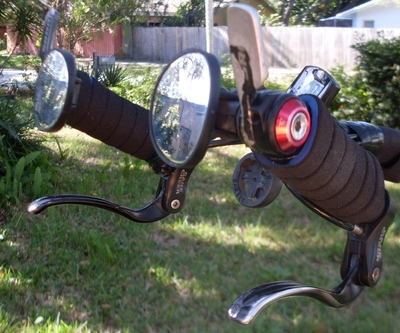 You can even countersteer at speed by very gently pressing your palm against the brake lever, which turns out to also greatly assist riding into a strong, gusty crosswind. No more fighting the bike. Just let your palm lightly do the work of steering against that crosswind. If you cut the crossbar so your forearms rest lightly against your rib cage, when descending at speed you can stabilize your arms against your rib cage and let the bars slightly float in your hands which, again, provides far less steering input, thus more stability and comfort at speed. The expansion plug is welded to the bar at a 12 degree angle to allow a more comfortable hand position. The angle provides a wide range of hand positions between rotating the stock (cut) bars and rotating the barends. 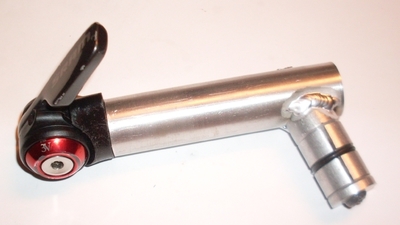 The expansion plug set screw can be fairly easily reached when the brake lever is removed. Note: Expansion plugs attachments are not structural! While these can sustain a reasonable amount of torque, please remember that they have to be held and used gently (as all recumbent handlebars should be).